According to a new tri-color coded system for reporting the status of the Romero beatification cause devised for this blog, whereby "green" denotes progress, "red" indicates stagnation and "amber" indicates moderate or slow forward motion, we analyze that the current condition warrants an "amber" designation for our vigil as of October 2010. 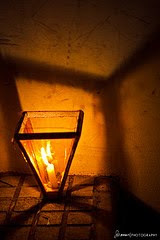 The vigil level designation will be indicated by the display of an amber or yellow lantern, styled after the lanterns or "farolitos" used in El Salvador for the vigil of the Nativitiy of Virgin Mary (September 7) in towns like Ahuachapan and Ataco. The designation of the yellow or moderate level of progress for the beatification cause was made after studying numerous recent reports of statements made by clerics knowledgeable about the current state of the canonization process. The analysis suggests that, after the Positio Super Martyrio ("The Martyrdom Brief") was drafted, the late Colombian cardinal Darío Castrillón Hoyos interjected objections to the process which took the cause out of its regular track and diverted it to a study at the Congregation for the Doctrine of the Faith which scrutinized Archbishop Romero's preaching and writings for orthodoxy and fidelity to Church teaching. This study took place from 2000-2001 and concluded with findings that affirmed the validity and authenticity of Romero's teaching. The process returned to its normal cause and was on the verge of being submitted to the Pope when further objections were raised, perhaps in an October 2005 meeting of the cardinal relators, which diverted the cause again, this time for an examination of Romero's "orthopraxy," or pastoral action, for evaluation of its evangelical prudence. According to a report published on the website of the Hagiography Circle, which provides information to researchers regarding the canonization process, Archbishop Romero's Positio was referred back to the Congregation for the Causes of Saints in 2009. This would indicate a return of the canonization cause to the normal channels. Other information has surfaced which suggests that the hold imposed to allow the orthoproxy study has been lifted. Numerous church officials, including the new Archbishop of San Salvador and the leaders of the Archbishop Romero Trust in Britain, have expressed a hope that Romero could be beatified around the time of the 30th anniversary of his martyrdom, an anniversary being marked this year. However, the Vatican is unlikely to make the anniversary a determinant factor. Other gestures that have come to light do hold more promise, the chief of these is the announcement by the Salvadoran Bishops Conference, that all the bishops of El Salvador would send a letter to the Vatican urging the beatification. The significance here is that one focus of the study of Romero's pastoral practices, almost certainly raised concerns about divisions among the Salvadoran bishops during Romero's tenure, which concerns would be assuaged by a letter signed by all the current Salvadoran bishops saying they are united behind Romero. In addition, some observers have speculated that the Church was concerned about antagonizing or embarrassing the Salvadoran government, long dominated by the right wing party ARENA, by beatifying Romero under a theory of persecution that implicates Roberto D'Aubuisson, the founder of the ARENA party, who is believed to have been the intellectual author of the assassination. The election of Mauricio Funes, a candidate of the party of the Left, and an open Romero devotee, appears to remove that concern. Therefore, it appears that the "freeze" on the Romero beatification process has been lifted, and we will indeed be searching news reports for evidence that the process has begun to move down the final stretch. After the Positio Super Martyrio is studied by the Congregation for the Causes of Saints, absent further objections, the next step is to send a recommendation to the Pope to approve the martyrdom of the candidate. Typically, the pope then signs and publishes a decree approving the martyrdom, and a beatification date can be set. On his way to the meeting of the Latin American Bishops in Aparecida, Brazil in 2007, Pope Benedict said, "I await confidently what the Congregation for the Causes of Saints will have to say on the matter" (of Romero's martyrdom). Now, we await "confidently," also.